After his pre-release statement: “I’d rather slash my wrists” than play Bond again, I’m guessing yes. Mexico City. Day of the Dead. I’m having flashbacks to #LiveAndLetDie. Different country, but the skeletons and other macabre images here are similar to the Mardi Gras themes/scenes in Roger Moore’s first Bond film. There’s a lot of the latter in this movie. That’s one powerful sniper rifle. The explosion here is kinda’ like in The Empire Strikes Back (1980) when Han Solo blew up the Imperial probe droid with his blaster…times a million. Actor Andrew Scott plays Holmes’ arch nemesis, James Moriarty, in BBC’s Sherlock. #SmartBlood Microchips are so last decade. No more anonymity for anyone. Nor any privacy. Be very afraid. “What a lovely view.” #MonicaBellucci is as fetching as ever. It’s really surprising that Bellucci hasn’t been in any Bond films up until now since she seems perfectly suited to portray a Bond Girl. Every Bond thug has his own shtick. Oddjob had his steel-brimmed bowler hat. Jaws had his metallic teeth. Mr. Hinx (Dave Bautista) has his metal plated thumbnails. Ammunition not loaded. Q is getting lax. The Pale King certainly lives up to his name. Although Wrinkle King would be a more fitting title. “Cut out the middle man.” Hilarious! My vote for funniest line in the movie. Bond needs a drink in his hand, not a veggie juice. The movie is chockfull of both. Bond vs Bautista. Amazing fight sequence. Kind of reminded me of Batman fighting Bane in The Dark Knight Rises (2012). Bond arrives at the #DesertStadium. That’s exactly what it looks like. The granite fortress also reminds me of the gigantic crater where they hid Airwolf. “Out of horror, beauty.” Sicko! Never knew that’s what Q stood for. Seems kind of obvious in retrospect. Don’t play chess with Ralph Fiennes…you’ll loose. Oh, and M isn’t for Moron, you punk. “I’ve got something better to do.” Classic Bond #DoubleEntendre. And a great way to end the movie, while leaving Blofeld alive and well to haunt Bond in future movies. Final analysis: some entertaining moments, but an unwieldy actioner that squanders its superb cast. Rating: 2 1/2 out of 4 stars. Good Bond, but not great Bond. James Bond will return, but who will play him? There’s an old expression: don’t bite the hand that feeds you. Pragmatic and didactic, this saying definitely applies to Daniel Craig’s pre-release statement that he’d rather have his wrists slashed than play Bond again. While it’s unclear what prompted such a vitriolic retort, one thing we can say with absolute certainty is that Bond has been pretty good to Craig over the years. In fact, his career might still be stuck in second gear with obscure indie films like Layer Cake (2004) or commercial flops like The Golden Compass (2007) were it not for Bond. Aside from Craig’s comment, which clearly hints at a “disturbance in the Force” behind the scenes, this film’s resolution also makes his continued participation in the series dubious a best. Although Craig’s commitment to his craft cannot be questioned, it’s quite obvious that something is missing from his portrayal of Bond this time around. Something is missing from the story too…a big something. Despite a handful of rousing action scenes and some fine location work, the sum of the parts here falls far short of Skyfall (2012) (although it’s still a fair sight better than 2008’s Quantum of Solace, which, ironically, also features an industrial complex out in the middle of a desert that Bond blows up). What prevents this movie from being top shelf Bond is its scattershot story which features dangling plot threads (Monica Bellucci needed to factor into the story line somehow), a great deal of globetrotting without really accomplishing anything, a murky cautionary tale about the invasive nature of technology and decent, but certainly not earth-shattering, action sequences. Lead writer on Spectre, John Logan, has had a checkered past (Gladiator, 2000 and Star Trek: Nemesis, 2002) as a Hollywood scribe, and his efforts on this film are, likewise, a mixed bag. The movie certainly flirts with relevance in the way it addresses the increasing presence of Big Brother in our lives. The delivery system for this Patriot Act on speed—smart blood—has far-reaching implications for the future of our world, not to mention being a clever, cutting-edge concept. The shadowy, extra-governmental agency story element has been done many times before (remember the Cancer Man’s cabal in The X-Files? ), especially in spy films, so these “gathering of evils” scenes, though well staged and filmed, are painfully passé. The drill scene is utterly absurd and stretches credulity to near sci-fi limits. The action sequences are vintage Bond, which is to say visually exciting but completely unrealistic, e.g., the scene where the roof collapses and Bond ends up falling right onto a couch. Yeah right! The subplot centering on the 00 program becoming defunct is eerily similar to the disbanding of the IMF in this year’s Mission: Impossible—Rogue Nation (and how similar is Spectre and the Syndicate in operation and objective?). The ultimate detractor to the story is its ADHD narrative, which moves its characters from place to place but doesn’t really go anywhere. There’s no MacGuffin here (at least not in the traditional sense), no clear-cut goal and no real sense of accomplishment at the end since we all know that the villain will be back in future films. Additionally, it’s obvious to anyone in the audience that Bond’s determination to put his career as a spy behind him can’t possibly last. 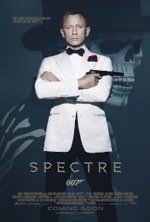 Ironically, even though Spectre has moved the franchise forward, it’s actually set it back. Sad. So will Craig be back as Bond? Doubtful, but that might be a blessing in disguise if the actor isn’t fully invested in the role…that would be a disservice to the franchise and the fans. If Craig does decide to move on, let’s just hope it doesn’t take the producers four years to find a replacement like the last time. After all, there is such a thing as Bond withdrawals.